This summer STEMteachersNYC engaged with 207 educators from around the world through hands-on professional development in STEM for teachers, by teachers. 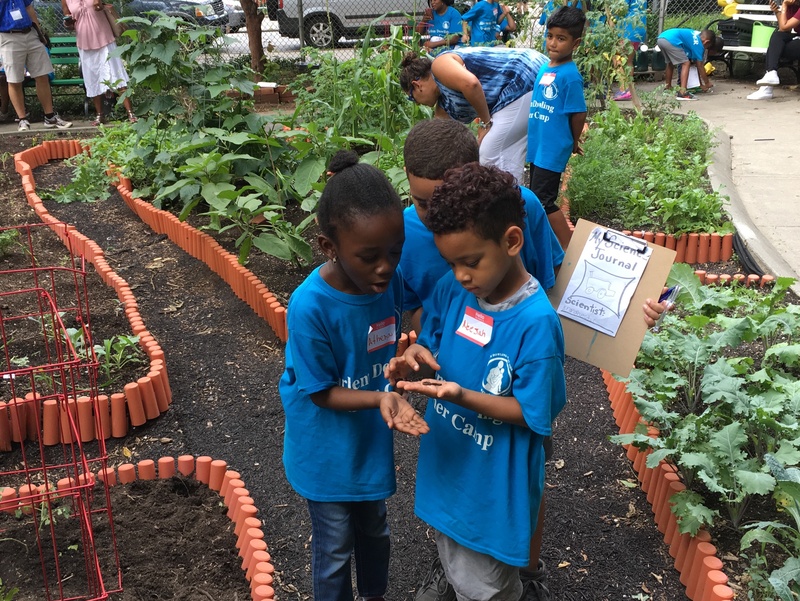 In partnership with 5 school sites around the city and region, this was one of our largest summer programs yet. Not only did we deliver household favorites like Introduction to Modeling Instruction and Standards-Based Grading, but we also added some new workshops to the lineup including Kelly O’Shea’s Designing for Discourse and Sensemaking in Physics, and a modified version of Computational Modeling in Physics in collaboration with the AMTA and AAPT. STEMteachersNYC also worked closely with the NYC Department of Education to deliver 3 customized workshops for this summer’s Science and STEM Institutes, at the request of NYC Department of Education Director of Science, Greg Borman and the STEM Department’s Elaine Carman. Each of the workshops was filled to capacity, and received exemplary feedback. Ingrid Buntschuh, Citywide Instructional Lead for High School Science sent a special commendation, describing our workshops as “relevant, engaging, minds-on, thoughtful sessions that attend to the needs of the teachers.” In a similar partnership with New Visions for Public Schools, STEMteachersNYC Instructional Designer Mark Schober and upcoming board member Kelly O’Shea piloted the first unit of a new High School Physics Regents curriculum that will meet the needs of New Vision’s diverse school communities. Finally our second cohort of teachers involved in 100kin10-funded program Kid Talk Teacher Talk in Elementary Science launched this July at the Ralph Bunche School in Harlem. Project directors Jason Sullivan and Amy Wish co-led a fantastic program to support 26 elementary school teachers and mentors across the city in improving their science instruction and discourse management with students. Through the two week session, participants had a chance to engage with youth in grades K-5 from around the Harlem area in a dynamic lab school model. As the new school year unfolds, participants will begin to pilot new strategies and techniques with the support of mentors and the KT3 team. 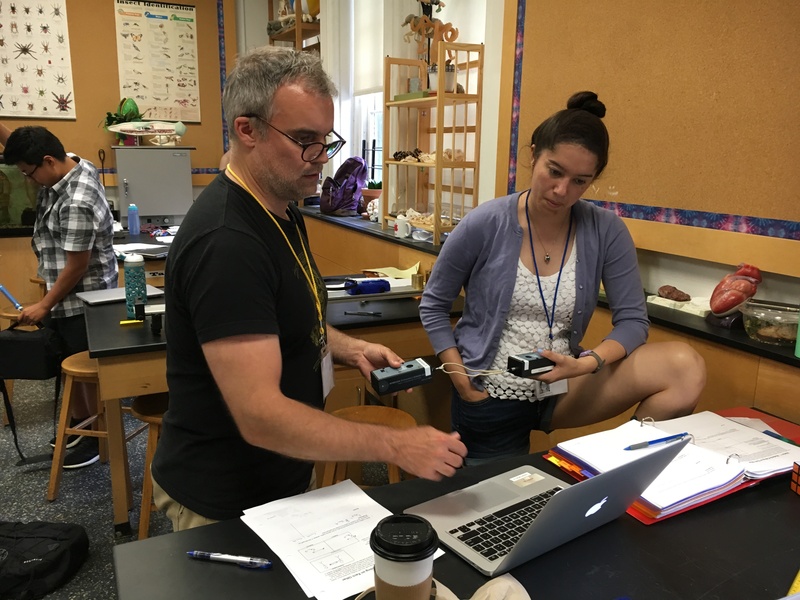 This summer STEMteachersNYC offered two sections of our increasingly popular Biology Modeling workshop in NYC and at the Storm King School, led by Master Teachers Chris Resch and Glen Stuart. At the invitation of the NYC DOE, STEMteachersNYC workshop leaders Matt and Chrissy Dilley also piloted a new workshop focused on the NYS Living Environment curriculum for educators who teach biology and other natural science courses. The workshop was a key part of this Summer’s NYC DOE Science Institute at Murry Bergtraum High School in lower Manhattan. All of the workshops were well received and reflect STEMteachersNYC’s commitment to supporting the needs of biology educators around the region. This spring STEMteachersNYC launched a partnership with New Visions for Public Schools, a non-profit which has designed, created and sustained NYC public schools for 25 years with 80 schools now under its wing. STEMteachersNYC former and upcoming board members, Kelly O’Shea and Mark Schober are working on creating a new course: “High School Physics,” that fits well with the needs of NYC public schools and which incorporates current best practices in teaching. Kelly and Mark worked together this summer to produce and pilot materials covering “Forces and Motion” – the focus of the initial month or two of most courses. STEMteachersNYC organized a special workshop for New Visions teachers who are now piloting the course in their classrooms. As the year progresses, Mark and Kelly will be working on developing materials for many of the remaining topics in existing courses, with close attention to the NYSSLS and the NGSS and to the evolving plans for revising the Regents Exam. This summer STEMteachersNYC welcomed the second cohort of elementary educators to KT3. Building on the success of last year, we were able to cultivate a number of teacher teams from the same school and establish a more robust culture of community-building and networking among participants. In total we worked with 20 teacher participants and 6 mentors. We were also able to revise workshop goals and activities to better meet the needs of participants, including Digital Narratives, 3 Modeled Launch activities, improved mentor involvement, and more attention to planning skills. More students participated in the lab school setting compared to last year as well, and our partnership with PS 125 continues to be strong. The sense of community among participants has been more robust this year, and allowed us to manage grant funds such that we will be able to extend the program an additional year. The extension year program will prioritize a cohort of schools connected to our main partnering school, P.S. 125 The Ralph Bunche School. It is our hope that concentrating on a small set of schools will enhance school culture around professional development and provide opportunities for administrators to create positive work environments. Finally, a number of KT3 participants have also launched an initiative to develop and lead Elementary-focused STEM workshops including Cohort 1 members & mentors Juliette Guarino-Berg, Beverly Chang, Kerry Kline, Kelly Davison, and Cat Garland. The first workshop of a two part series, Seeing Science Everywhere, launches on November 3, 2018 for teachers in grades PK-2, with a follow up session scheduled for December 9th targeted towards educators in grades 3-5. 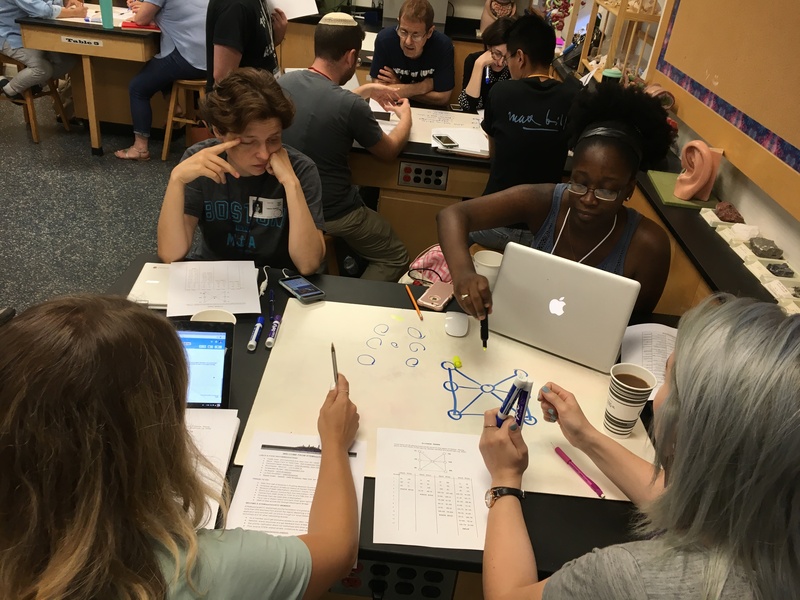 This summer, STEMteachersNYC organized the third summer of the Computational Modeling in Physics program, in partnership with the American Association of Physics Teachers, American Modeling Teachers Association, and Bootstrap, a computer science program at Brown University. A cohort of 10 teachers participated in the program to learn how to integrate computational thinking and coding into their physics curricula. Participants got an introduction to the powerful new Pyret language, a browser-based, state-of-the-art teaching vehicle. Through hands-on activities and discussion, participants were able to practice the basic techniques of Modeling Instruction, a student-centered approach to teaching and learning while also working through computational modeling curricula developed over the past 2 years. This included the basics of programming in Pyret, learning how to write simple functions and modify existing code, with opportunities to generate programs on one’s own. Computer-generated models helped participants explore new approaches to physics topics such as constant velocity, uniform acceleration, inertia and force pairs, and Newton’s 2nd law.